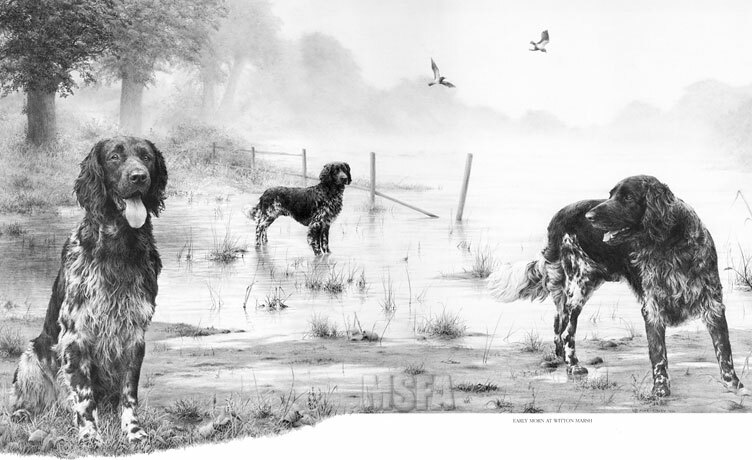 "Early Morn at Witton Marsh"
We had almost continuous rain during the winter of 1997-98, which produced a shallow lake extending from our land into the uncultivated field opposite our house. Our land eventually dried out but the rough field gradually turned into a wetland area - a marsh that attracted herons and hares, pairs of nesting Mallards and Moorhens, Coots and a Curlew. The place was quite magical and I determined to capture it before it was lost to us. A pair of Lapwings (or Plovers or Peewits) moved in to breed and it is these that are depicted in the drawing. Despite a certain amount of artistic licence, the view as depicted is substantially the scene as I experienced it — and, with binoculars in hand, I visited five or six times a day. You can read more about the area used for this setting. The original drawing took 115 hours to complete and is now in a private collection in England.